Since it's Sunday, I'm reminded of my commitment to implementing the new ritual of experimenting and perfecting my makeup. Today we're blessed have to a lesson from the makeup artist talented enough to have worked with Beyonce. I've mentioned some tips from Sir John before. Like how he recommends that we use eye cream all over the face for an intense boost of moisture. He also let us in on how Beyonce skin stays flawless with the help of monthly enzyme peels. We've received lots of skin care secrets from him. It only makes sense to learn some makeup application techniques from Sir John since that's what he's known for. Luckily for us, Sir John shares a few video tutorials on his Youtube Channel. In one video he demonstrates the step by step technique that creates a bold cat eye in a matter of minutes. The model in the video is Kahlana Brown. You may remember her from a previous "Who to Follow" feature from a couple of months back. What immediately caught my eye was the bold color payoff from the Silkissime eyeliner. It's a "liquid pencil" liner with long lasting wear. According to L'Oreal, Silkissime can last up to 16 hours. People who love this liner describe it as gliding on the skin like butter. It sorta reminds me of Marc Jacob's gel liner but at a fraction of the price. Sir John reveals a neat little trick that I tried today and loved. He recommends lining the base of the eye with a brown pencil instead of black. 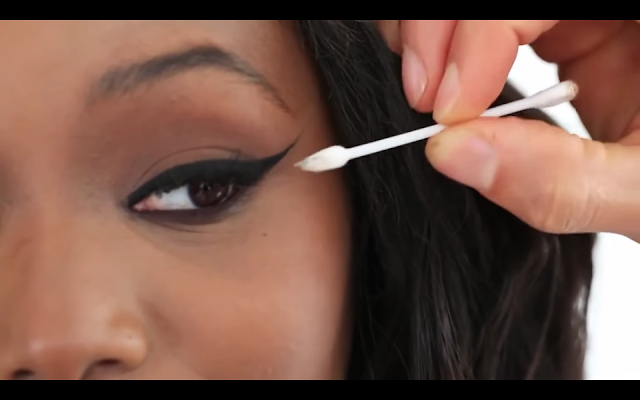 I love this tip because it softens the look and makes it much more wearable (see pic above). He also shows us what tools to use to clean up to look so the end result is flawless. The entire process was less than 2 minutes and Sir John really breaks it down easy to follow steps.